For my summer project, I’ve been working on the curriculum development of the Guide and Outfitters Recognized Professional program, also known as the GORP program. The purpose of the GORP program is to create an educational standard for guides and increase the professionalism of guiding. This way, guides who go through the program can better market themselves to their visitors and help them get more out of their experiences. At this point in the summer, I have finished most of my work on the curriculum aspect and am now starting to interview guides to learn more about what the profession and how the GORP program may help them. Charleston is well known as a small town with beautiful views of the marina and excellent fishing. The best way to experience fishing in the area is going out with one of the three charter companies. I got to meet with two charters and learn about their owners, and what makes each business so special. Captain John Blanchard single handedly runs Sharky’s Charters. John started as a commercial fisherman but decided to switch to guiding and has lead charters for four years now. He is the only captain, and takes out smaller groups of 4-6, which is a great way to get more valuable one-on-one instruction. 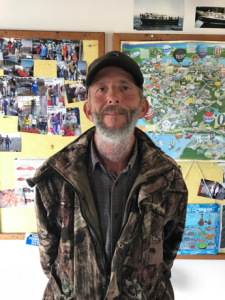 When asked what his favorite part of being a guide was, he said that he likes meeting people and forming friendships with his customers, who frequently return for fishing trips. He also loves sharing his passion with others and remarked “If you do what you love, you don’t work a day in your life”. 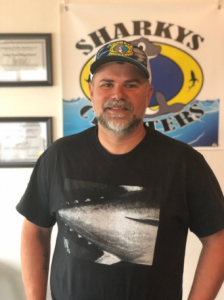 Kurt Smith is one of the two captains at Betty Kay’s Charters and has about 18 years of experience. He will be taking over as owner of the company in the upcoming months. Kurt takes pride in his charter company’s commitment to customer service and making sure that every customer has a fun trip and great experience. He thinks that the value provided by hiring a guide is immeasurable, as they have all the “local insight” and know where the fish are better that any visitor could figure out on their own. Betty Kay’s is able to accommodate larger groups and more people depending on trips, fitting about 20 passengers on a boat. One of the universal factor of fishing charters is they are entirely weather dependent. If the ocean is too rough or winds are too strong, they must cancel charter trips for that day, so it is important to be flexible when hiring a charter company. If you or someone you know is interested in fishing in the Charleston area, try giving one of the local charter companies a call! As an Oregon Sea Grant Summer Scholar, I am working with OSU extension and WRCA to develop curriculum for training guides and outfitters on the Oregon coast. I’ve loved getting to explore Bandon and learn about everything the tourism at the resort has done to help the community. It’s been an amazing experience so far learning about the impact tourism can have on communities, and I look forward to learning much more as the summer continues.